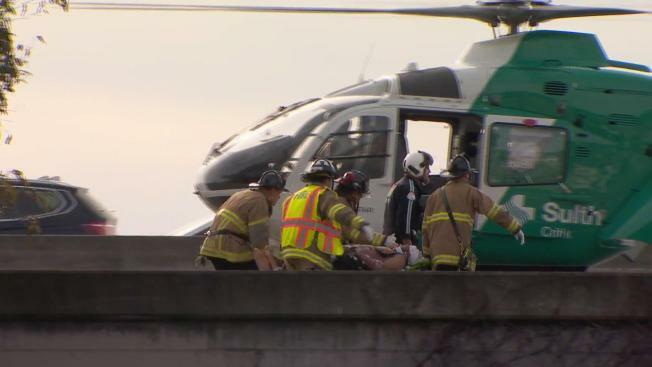 A man and a woman were hurt in a targeted shooting that prompted eastbound lanes of Interstate 80 in Richmond to be shut down Thursday afternoon, the California Highway Patrol said. Five or more shots were fired, and three suspects have been taken into custody, according to Richmond police. Officers located the suspect vehicle, described only as a silver Dodge, at Chancellor Avenue and 17th Street in Richmond and pulled it over about 30 minutes after the shooting, police said. The male victim, who had been driving a Honda minivan, suffered five gunshot wounds and was airlifted to a hospital, the CHP said. The woman was transported by ambulance; her condition was not known. A red vehicle at the scene was involved in a collision with the minivan after the shooting, the CHP said. The CHP said it received reports of the shooting from multiple witnesses about 3:30 p.m., and information from those witnesses helped officers track down the suspects. Eastbound lanes of Interstate 80 in Richmond were shut down Thursday afternoon due to a shooting investigation. Eastbound traffic was at a standstill and backed up for miles as the evening commute was ramping up. The CHP reopened the lanes just before 9 p.m. 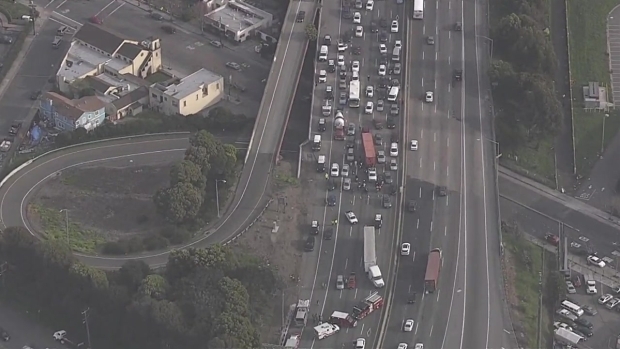 The shooting is the latest in a string of shootings along East Bay roadways, mostly on I-80 and Highway 4, over the past few years. In response, some cities such as Pittsburg have installed cameras on the roadways. Hercules Councilman Dan Romero and a dozen other local leaders have asked the state for $2 million to install security cameras and license plate readers along I-80 and other roadways. "This will continue to happen until the state pays to have cameras installed along the freeway," Romero said Thursday. Romero is upset because little action has been taken. "We’ve been lucky," he said. "Maybe it’s been targeted, but what happens when one day a young family loses their child?"